Clearly, Real Betis is one of the most surprising teams in the European football this season. Before the season, Betis appointed Quique Setién as their new manager. Setién was quite successful with Las Palmas the season before, installing a functional positional play which not only helped them win a game but also was fantastic to watch. At Real Betis, Setién repeated that process again. The small difference is that Betis has players more suited to that style and with a higher individual class. This results in the successful season they enjoy right now. Currently, Real Betis fifth in the league. Behind them, clubs like Villareal, Celta Vigo and their biggest rival Sevilla FC have to fight for points in order to qualify for the Europa League. One of the discoveries this season was the young talented midfielder, Fabián Ruiz. Fabian´s abilities suit perfectly in the system of Quique Setién which earned him a regular starting spot in Setién´s line-up. Normally, Fabián starts as one of the central midfielders in their 3-1-4-2 line-up. However, he also played as a deep-lying playmaker in front of the back-three. Where has he his strengths? 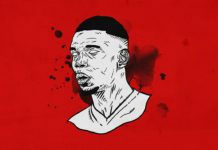 And why does every top-team want to sign him? First of all, Fabián is such a perfect fit for Setién´s system because of his passing abilities. He has a great technic and is able to play accurate passes even under pressure. Furthermore, he not only plays the simple passes, his through-balls are also a real threat to many teams which helps Betis to create chances. Besides, his great technic, his vision and feeling for the game is his biggest strength. Fabián is great in recognizing the dynamic of the game and potential open spaces in the defensive shape of their opponent due to off-ball movements of his team-mates. For instance, in that situation. The dribbling on the right-side pushes Espanyol´s defence to the back. All the players shift over to the right side. Because of the missing defensive movements of certain Espanyol players, a wild open space appears in front of the midfield line. At first, Fabián also moves to the right side, however, he realizes the open space and therefore quickly changes direction. With the positioning in the grey space, he furthermore gives his team-mate a passing-option in order to maintain possession and the possibility to attack the far-side. After receiving the ball in the grey space, Fabián now has enough space to operate. The defence of Espanyol doesn´t have immediate access to him which gives Fabián enough time to control the ball and aim the open space. In the follow-up of this situation, Fabián proves his great understanding of the game again. He plays the pass in the open space with the right amount of speed in the right moment. Because of the movement of his team-mate, the Espanyol defenders relocate their position in order to block the passing-line. Fabián not only recognizes the open passing-line, he furthermore knows that Junior makes a run from the depth and will appear in the blue space. This action of Fabián Ruiz shows perfectly the strength of Betis this season. 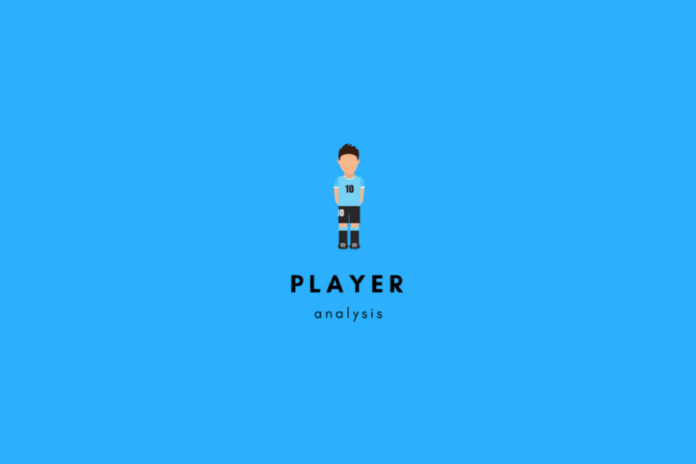 On the one hand they have great players with a high football IQ, on the other hand, all of the players understand the basic tasks in the system as well as the movements of their team-mates. As I mentioned above, Fabián possesses a high football IQ. Not only can he use his great vision and feeling for the dynamic of the movements of each player, he furthermore thinks the game a step ahead. Most of his passes are played at exactly the right moment. In this situation, he received the ball on the left side from Joaquin and could simply play the pass to the full-back who made an overlapping run. However, Fabián realizes that the full-back could easily receive the ball in the box and would, therefore, be difficult to defend. By simply waiting how the situation evolves, he provokes an adjustment of the position by the defenders. When the full-back is in position, Fabián used the available space between the defenders to play the pass in the space behind Bilbao´s last line. By using “la pausa” Fabián brought his team-mate in a better position. In the last few years, the physical abilities of the players improved a lot. Consequently, the available space for players with the ball got smaller. Therefore, you need players who have the technical ability to control the ball under pressure and the vision to decide quickly which action is the best in that specific situation. Fabián Ruiz possesses the necessary skill. He has a great vision under pressure, dribbles nicely especially in tight spaces. With all those abilities he can be a focal point of an offence of one team. Clearly, he isn´t on the top-level so far but he definitely has the potential to become a top-class midfielder. Fabián received the ball on the edge of the box, with to ball fakes he tried to unbalance the defender in order to shoot on goal. However, that was not successful. Consequently, Fabián dribbles towards the centre, followed by one defender who defends him aggressively. Nevertheless, Fabián is capable of controlling the ball and also looking for open team-mates. With one look he identifies the hole in Valencia´s defence and finds Joaquin on the left side. The pass was perfectly timed and no one could intercept that pass through the box. But, Fabián is not only great with the ball, he also moves quite intelligent without the ball which helps his team-mates because he offers a passing option. Furthermore, he can be a real offensive threat. 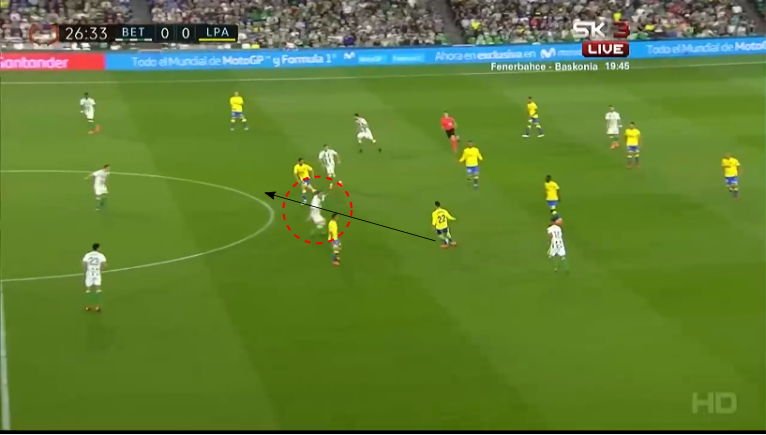 His sprint from depth into the box or his supporting movements up-front are a big part of Betis offensive play. Here, Girona has a hole in their defence (grey marked space), Fabián realizes that his defender only orientates towards the ball, therefore, Fabián can move in the open space without having an opponent. Besides the hole in the centre, Girona´s defenders are spread wide which opens space for Fabián Ruiz. At that moment his team-mate doesn´t play the pass, nevertheless, Fabián continues his run and receives the ball behind Girona´s centre-backs and he can easily shoot on goal, but doesn´t score. Again, Fabián shows his high game intelligence. In that situation, he moves in the opposite direction of the centre-back. His team-mate could only pass the ball in the blue marked space, that’s why Fabián used a curved run to get in that space. The timing of his run is perfect, due to the movement of the centre-back he could keep up with Fabián and the Spain U21 national player got first to the ball. Besides his offensive abilities, Fabián Ruiz is also a good defender. As for offence, the same goes for defence. Fabián reads the game nicely and is able to close passing-lines and intercept passes. 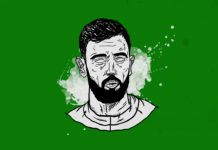 The positional play of Real Betis makes it easier for every player because of the connection offensively, usually, a lot of players are positioned near the ball. Here we have a typical transition situation. Las Palmas can intercept the combination play of Betis. Now Betis tries to regain the ball as quickly as possible. Fabián moves forward in order to tighten the available space for Las Palmas. He has to option. Either mark the opponent or move into the open space to close passing-lines. In that situation, he nicely reads the opponent based on his body position and can intercept the pass. 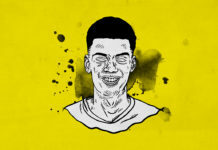 During the defensive phase, he not only shows his solid anticipation and understanding of the game, he also has the physical abilities in defensive duels. This makes him a complete central midfielder who easily can play a deeper role before the defence or higher up the pitch. Fabián Ruiz is clearly one of the most promising talents in Betis team. After Ceballos left Betis for Real Madrid, Fabián got his chance to start regularly in the team of Quique Setién. He is a big part of their successful season. If he stays over the summer is questionable. Some of the bigger European teams will surely try to sign him. However, he still is in a development process and at Betis, he has the opportunity to play a lot.